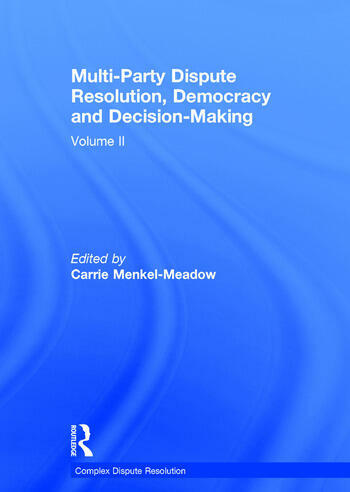 The articles selected for this volume draw on game theory, political science, psychology, sociology and anthropology to consider how the process of dispute resolution is altered, challenged and made more complex by the presence of multiple parties and/or multiple issues. The volume explores issues of coalition formation, defection, collaboration, commitments, voting practices, and joint decision making in settings of increasing human complexity. Also included are examples of concrete uses of deliberative democracy processes taken from new applications of complex dispute resolution theory and practice. The selected essays represent the latest theoretical advances and challenges in the field and demonstrate attempts to use dispute resolution theory in a wide variety of settings such as political decision making and policy formation; regulatory matters; environmental disputes; healthcare; community disputes; constitutional formation; and in many other controversial issues in the polity. Contents: Introduction; Part I Foundational Issues in Multi-Party Dispute Resolution: How is It Different? : Strategic barriers to dispute resolution: a comparison of bilateral and multilateral negotiations, Robert Mnookin; What we have learned about teaching multiparty negotiation, Lawrence Susskind, Robert Mnookin, Lukasz Rozdeiczer and Boyd Fuller; Sequencing to build coalitions: with whom should I talk first?, James K. Sebenius; Deliberative trouble? Why groups go to extremes, Cass R. Sunstein; Strategic uses of argument, Jon Elster. Part II Practice: Complex Dispute Processes and Decision-Making in Action: Multiparty negotiations, Leigh L. Thompson; Norms of deliberation: an inductive study, Jane Mansbridge, Janette Hartz-Karp, Matthew Amengual and John Gastil; Voting, Howard Raiffa; Proceeding to a constitution: a multi-party negotiation analysis of the Constitutional Convention of 1787, Dana Lansky; Mediating the war of olives and pines: consensus-based land-use planning in a multicultural setting, Hephzibah Levine; What is consensus?, Lawrence E. Susskind and Jeffrey L. Cruikshank; On the ethics of planning: what profiles of planners can teach us about practical judgment and moral improvisation, John Forester. Part III Deliberative Democracy and Consensus-Building Processes: The lawyer's role(s) in deliberative democracy, Carrie Menkel-Meadow; Mediating public disputes: obstacles and possibilities, Lawrence Susskind and Connie Ozawa; Managing meetings to build consensus, David A. Straus. Part IV Evaluations of Multi-Party Decision-Making and Deliberative Democracy: Implementing consensus-based agreements, William R. Potapchuck and Jarle Crocker; Regulatory negotiation and the legitimacy benefit, Jody Freeman and Laura I. Langbein; Scaling up deliberative democracy as dispute resolution in health care reform: a work in progress, Carrie Menkel-Meadow. Part V Coda: Coda; Name index. Carrie Menkel-Meadow is Academic Co-Director and Professor of Law, Center for Transnational Legal Studies, and A.B. Chettle, Jr. Professor of Law, Dispute Resolution and Civil Procedure, Georgetown University, USA and Chancellor's Professor of Law, University of California, USA.